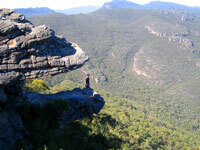 The lofty summits and ridgelines of the Grampians region provide inspiring natural beauty in a park that is home to a variety of habitats, unique wildlife and more than one third of all the plant species found in Victoria. The park is particularly well known for its colourful displays of springtime wildflowers, which are at their best during October. There is an abundance of wildlife in the lowlands, including emus, kangaroos, possums, koalas, wallabies and more than 200 species of bird. The park also has some interesting Aboriginal art sites among its 167,000 hectares of woodland, heath, swamp, forest and sub-alpine zones. There are campsites and some wonderful overnight walking trails in the park, as well as some shorter walks for those just wanting a pleasant stroll.